Are you Celebrating Advent? 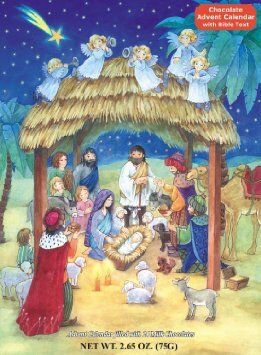 Do you wonder what Advent is? 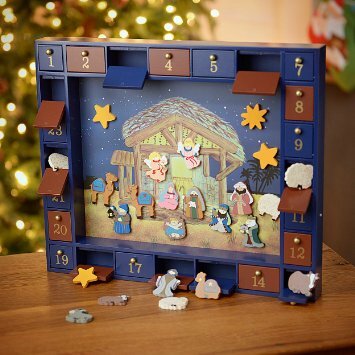 For a long time…even as a Christian, I did not know what Advent was. There is no shame in not knowing…the Christian walk is about learning and growing…right?! 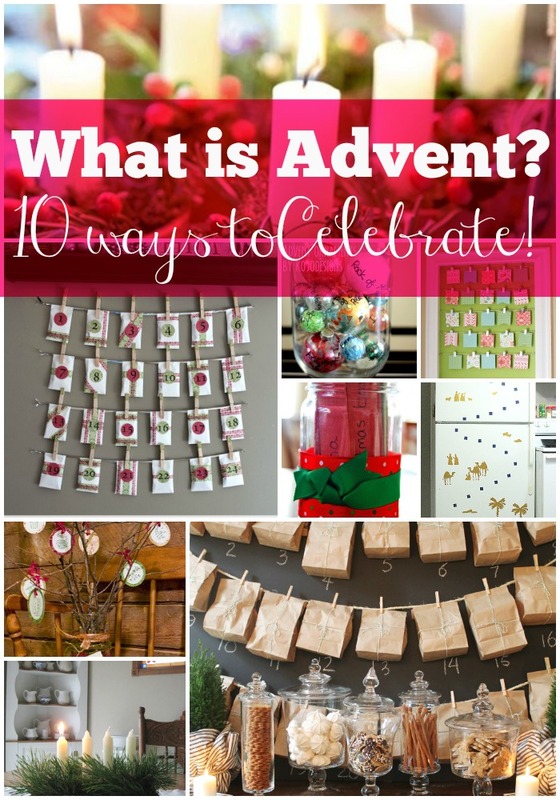 I wanted to share these 10 Wonderful Ways to Celebrate Advent at Home, so that you may consider having a fun and Christ Centered Christmas. I hope you will join me in Celebrating Advent.. because He has come and He will come again! Noun: 1. The arrival of a notable person, thing or event 2. The first season of the church year, leading up to Christmas and including the four preceding Sundays. Advent does NOT need to be celebrated only on certain days (like Sundays) Use all of the ideas below to do what is BEST for YOUR family. If you are starting a little late in December…THAT’S OK! This video perfectly explains what Advent is perfectly! 3 I made this huge chalk board for our wall a while back..
4 You can do Advent all in one night!! 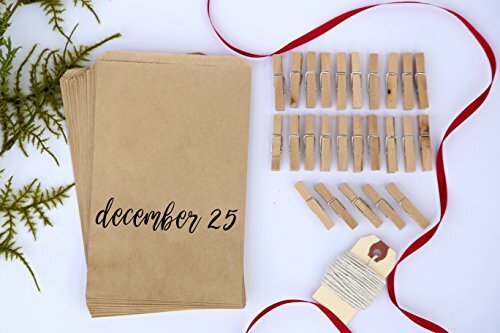 I also realize that not everyone wants to make Crafty Advent Calendars from scratch so I have added in some other fun Advent Craft kits that might be easier or give you more ideas! 25 Days of Service by I Heart Nap Time ~ I LOVE how Jamielyn did these acts of service for her advent! Awesome idea! You can also order this little kit that is just like the one above, but with Scripture and activities already to go…simply click on the pic! You can do so many things with these cute paper bags. They are already numbered and ready to go. 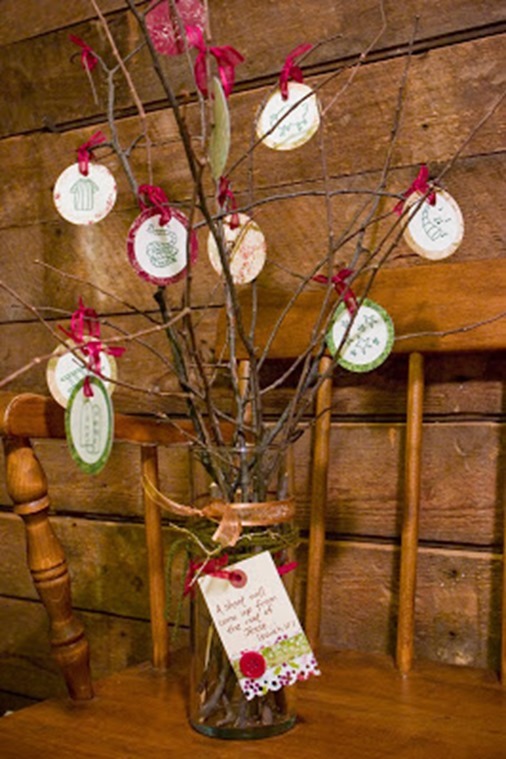 Simply put scripture and little treat in the bag and hang on the heavy twine with clothespins. All in a neat little kit! You know the Elf on the Shelf rage that’s been going around these past 5 years or so. WELL DaySpring has a perfect way to participate in the ALL the FUN except keeping the focus on Christ for Christmas! 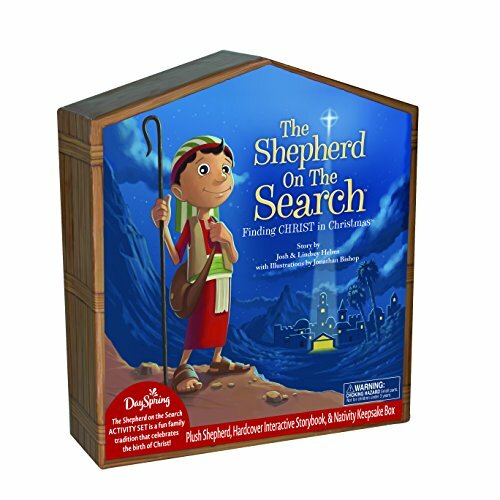 Celebrate Advent with The Shepherd on the Search! Just like Elf on the Shelf, this adorable Shepherd comes with a book full of fun activities and adventures that will keep the kids guessing until Christmas! LOVE! I think I’m getting old because I love anything with clothespins! This Advent Calendar by Abby of Just a Girl and her blog is so super cute and comes with Scripture Printables! 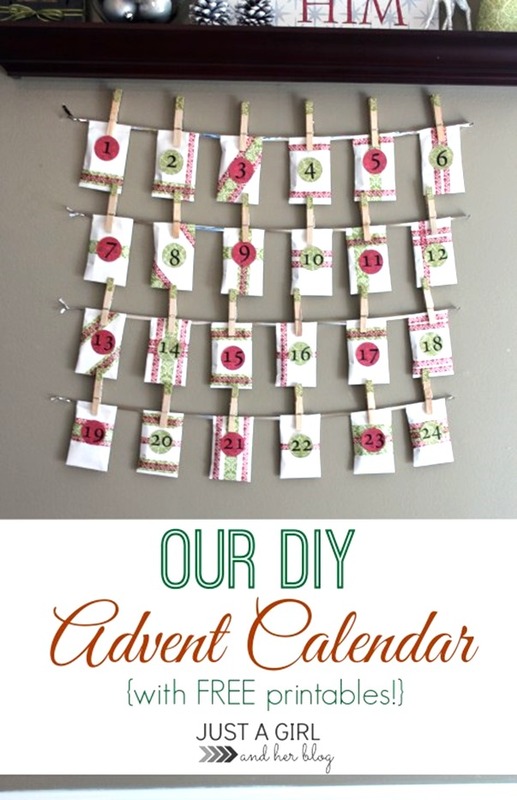 Love this Jesse Tree Advent Calendar by the Unlikely Homeschool very elegant and simple. She gives all of the Scripture verses to go along with it! You don’t have to do something every single day if this is just too overwhelming. Many have 4 Candles and light one each Sunday or chosen day and simply read a portion of Scripture that goes along with that week. 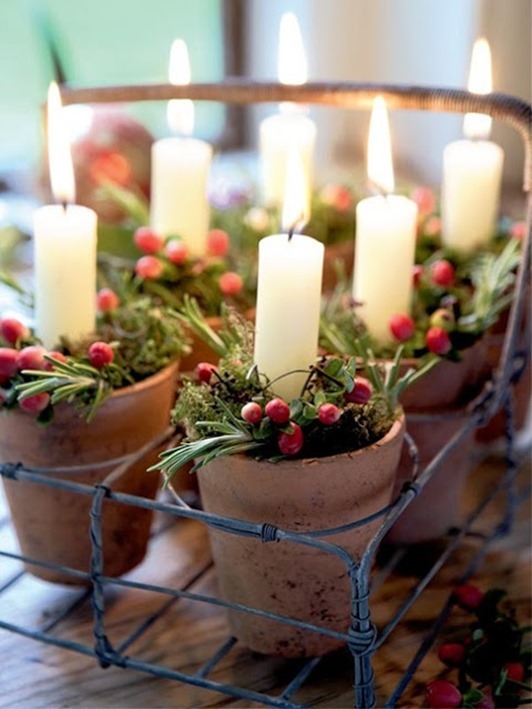 Here are a couple of super simple Candle arrangements you could use. 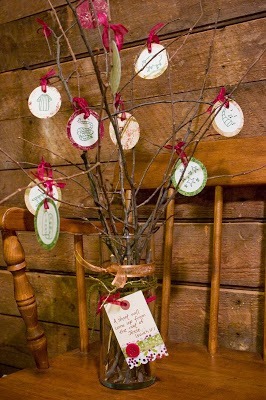 And another very simple but meaningful arrangement from Homespun Living. Use The Shepherd on the Search from above or make your own! Children love treasure hunts. There’s nothing quite as exciting as searching the house, knowing that a gift is waiting somewhere. To celebrate Advent each year, wrap little trinkets, chocolates and books, hide each morning. Then write simple rhymes and Scripture for each day, offering clues for the search. I made this huge chalk board for our wall a while back.. Since I have very busy teens, it would be unreasonable for me to expect them to sit down every night have a big family time. So using the chalk board is easy, quick and still getting to the heart of Christmas! You can do Advent all in one night!! Sit in a group and take turns reading scripture. Talk about how this applies to your life. Light 1 candle after each of 7 Scriptures are read.. Serve some very special desserts for the end to celebrate Christ’s coming again! 65 Stocking Stuffers for a Teen Guy – Do you have a teen guy on your list and you just can’t think what to buy for him this year? 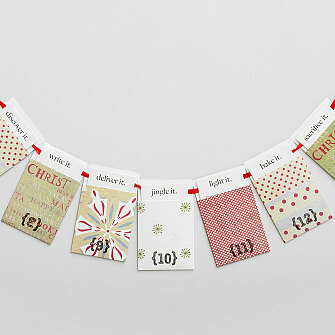 Well Mitzi comes to your rescue with no less than 65 stocking stuffer ideas! How to Prepare for Christmas Dinner – If you’re hosting Christmas Dinner this year you will not want to miss Candi’s schedule for making sure everything runs smoothly. Pinned for later, thank you! These ideas are awesome! Makes our felt christmas tree advent look cheesy! Yay for things other than gross, low-quality chocolate! Thank you for the post. LOL I know right! But I do love chocolate..any kind! HA! Not for Advent though 😀 Thanks for stopping by Andee! Blessings! Growing up, my church never emphasized Advent so I didn’t really know much on how to celebrate it until I was older with my own child. Once kids came along, I started incorporating Advent–celebrating in our own Smith House way–to focus our family traditions on the birth of Jesus. 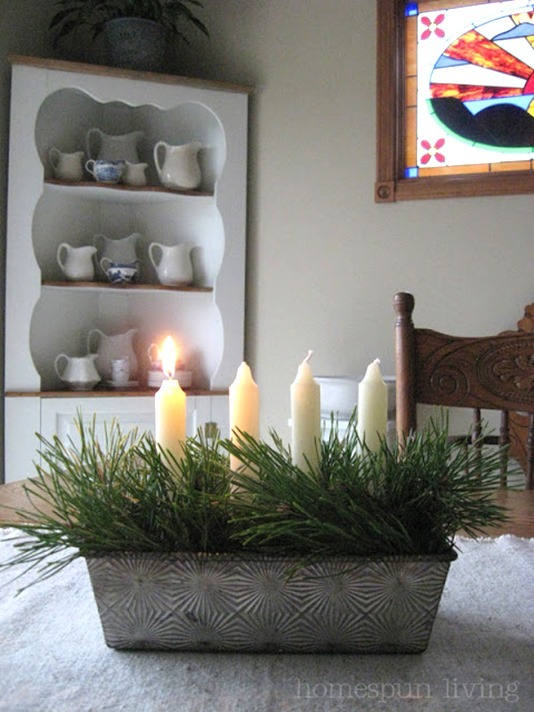 I lvoe this time of year and we never get around to doing anything special for Advent. I am saving this list for ideas. I love this post. 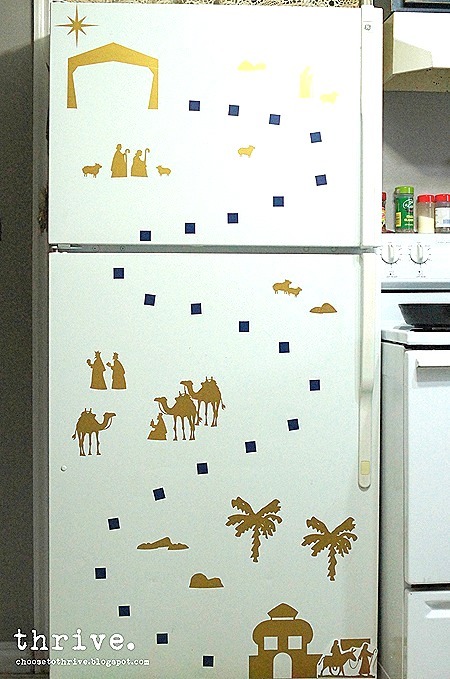 The kids are older, but I still think that we should be doing more advent things, instead of just being “ready for Christmas”. Thanks for these cute ideas. 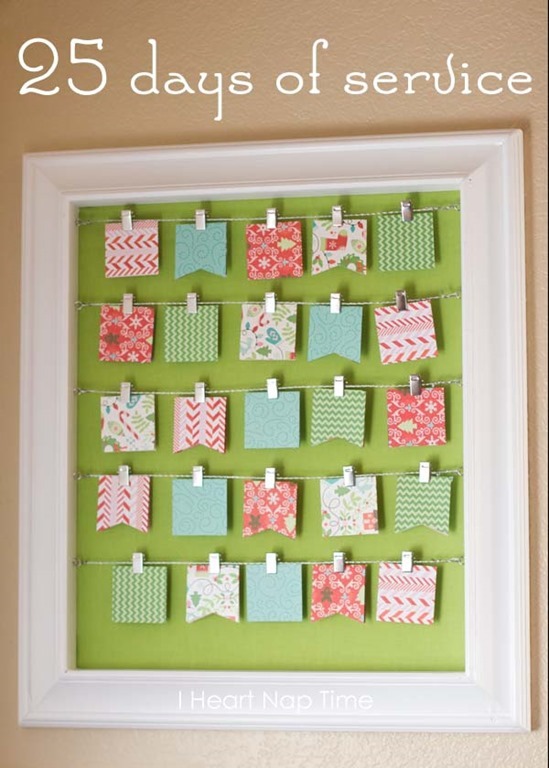 Spotted your post over at The Art of Home-Making Mondays on Strangers & Pilgrims… Thanks for sharing! Thank you for the great ideas of how to incorporate Jesus into my kids lives in a much more meaningful and life enriching way than a punch out window hiding a piece of chocolate. Thanks for sharing. These are great ideas! Saving these for next year! 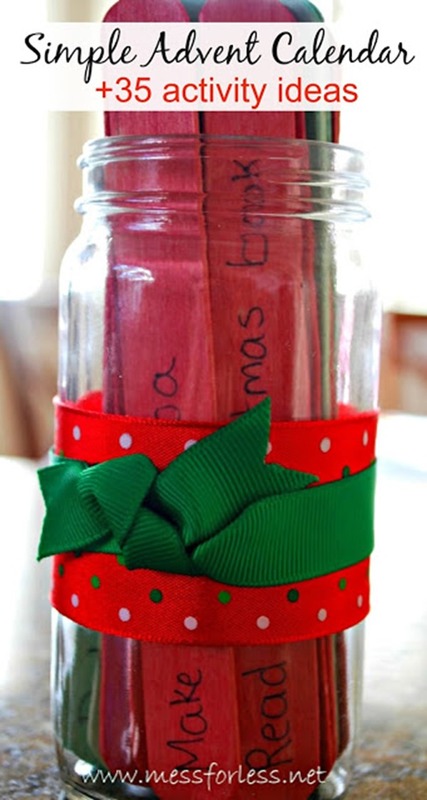 These are such cute ideas. I love how clever they are. I like them all. 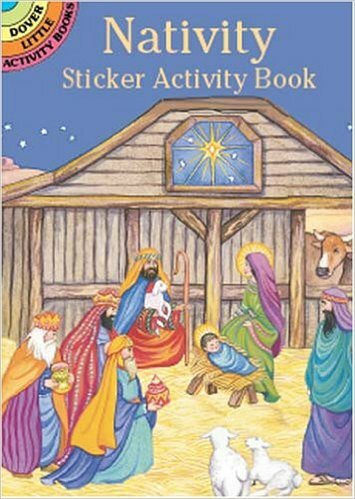 Even though I have always been a Christian, and even seen these countdown calendars, I never heard it referred to as “Advent,” now I hear it everywhere. I really like the meaning and purpose behind it. When we have our daughter next year, it will be a special tradition that we can start. 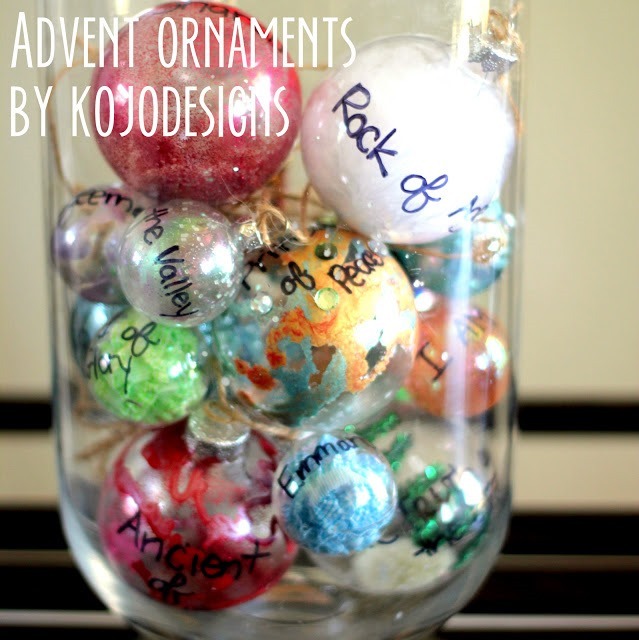 I really liked the bulbs with the different names of Jesus because you can discuss each one as a family before your child places it on the tree each night. 🙂 I also saw a great idea floating around a couple blogs of wrapping up 25 Christmas books, mostly children’s books or easy chapter books. 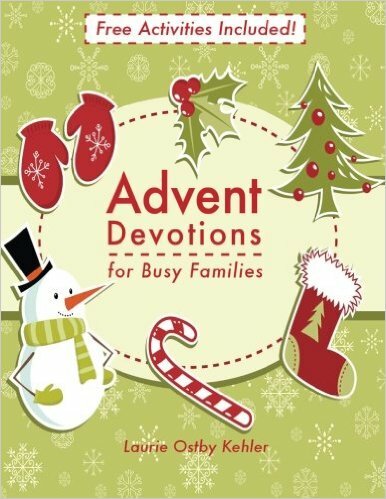 Each day your children pick out one to unwrap and read–it is a fun and educational way to celebrate Advent. Thanks for sharing great ideas! What a great list of ideas! And I love the video too. I grew up in a Christian home, but we never really celebrated “Advent” specifically. Will be sharing on social media! 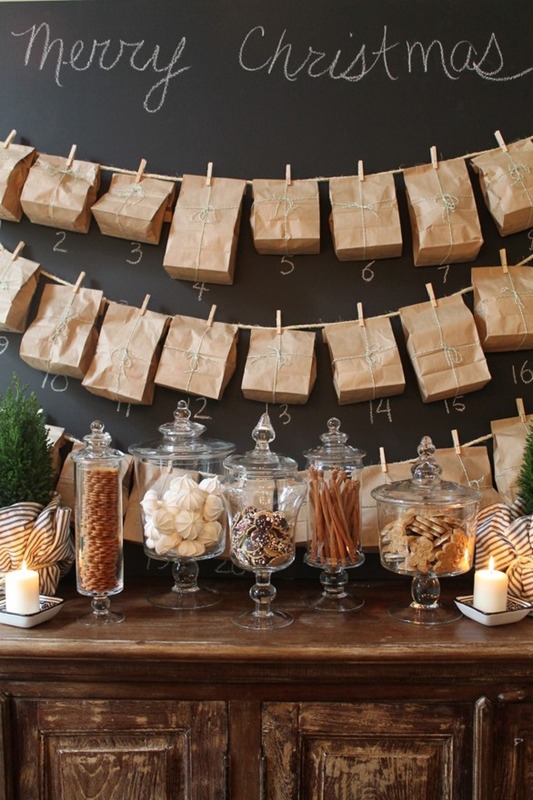 Thank you for the Advent roundup. It’s nice to see new ideas on such an old tradition. Shari, These are awesome ideas. I especially like the one with the flower pots and the one with the tin pan. Thanks so much for adding it to the Blessing Counters Link Party. Blessings and hugs my friend!